In the year 2000, our family spent $2615 on our utility bill. For a family of five in a 2800 sq. ft. house we used on average 33.4 kilowatt hours (kwh) per day of electricity and 4.28 therms/day of natural gas. Our electricity consumption was almost twice that of the average household in our utility region (an area that includes most of California north of Los Angeles), though very close to the national household average. And our natural gas consumption was almost four times (!) that of the average household in our region. It was expensive! It was nuts. We live in San Francisco where it never gets very hot or very cold. However, our house was built in 1935 with pretty much zero insulation. In 2000 most of the windows were original and single-paned and only a few walls had been insulated. We didn’t have air conditioning or electric heat, so no big electrical draws there, but when the wind blew and the fog rolled in, you could’ve flown a kite in the breeze down our hallway. Looking back, I only hazily remember what we did to deal with that initial monster energy use. We put in a lot of fluorescent bulbs, got rid of an electric space heater, nagged the kids to turn off lights and stopped leaving outdoor lights on all night. That was also the year we got our first front-load washing machine and a new, more efficient refrigerator, both necessary replacements of dying ones. The next year our electricity use dropped nearly in half! Our natural gas use, however, was just about the same, and unfortunately that was the winter natural gas prices went through the roof in California. Yellow lines are solar production. Bars are what we bought. Negative numbers mean we sold more than we bought that month. 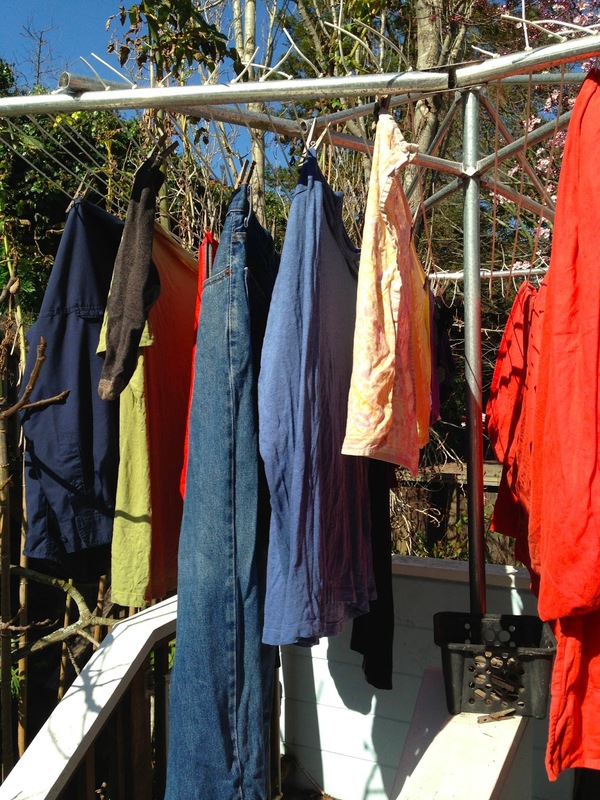 The next year I paid more attention to our programmable thermostats, experimented with the house temperature dropping a few degrees at night, and began hanging my laundry outside to dry. That resulted in a 10% drop in therms. At the beginning of the following year, we had a big remodeling project that involved, among other things, replacing fourteen single-pane windows with double-pane ones and insulating the walls of about a third of our house. Our natural gas use dropped 25% the following year! In 2004, both electricity and natural gas consumption crept back up, as energy use is wont to do. We added more insulation to the attic (there was a minimal amount already), and, for the next four years, our natural gas ran about 2.5 therms a day and electricity around 21 kwh/day. Things had definitely improved. But energy prices had also crept up. Even though we were using a third less electricity and 40% less natural gas than in 2000, we were spending $2000 per year on energy. Then I started reading about climate and energy issues. That was the point we began to tackle energy efficiency and renewable energy in earnest. In 2009 we installed solar panels on our roof. Our roof breaks east-west and is partly shaded in the winter by a taller building directly south, so seven panels ended up facing east and eight faced west on the sunniest half of the roof. Not optimal, but so it goes. To deal with vampire loads, I went around like a maniac unplugging every unnecessary gadget and wall wart I could from wall sockets in every room of our house. (It’s amazing what gets plugged in and stays there, drawing power year after year for no benefit whatsoever!) I plugged our media equipment into a power strip and turned it off at night. I put in ultra low flow showerheads (1.5 gallons per minute). 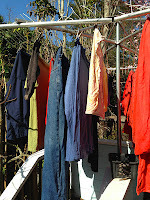 I bugged my kids about taking shorter showers and using towels at least twice before putting them in the wash. My oldest went off to college, so there was some less energy use, but I still had two active teens at home gobbling energy with showers, piles of laundry and electronic media gadgets. I turned down the heat. Boy did I get howls about that. I would point out to my kids that since they didn’t live Hawaii, they should expect to wear slippers and sweaters in the winter. This was not popular. I pointed out I wore wool and was willing to have the house even colder while home alone during the day. (Though I do admit it’s hard to sit still for any length of time in a house colder than 59 degrees.) Eventually we reached a compromise that 64 degrees was a reasonable ambient temperature when they were home. 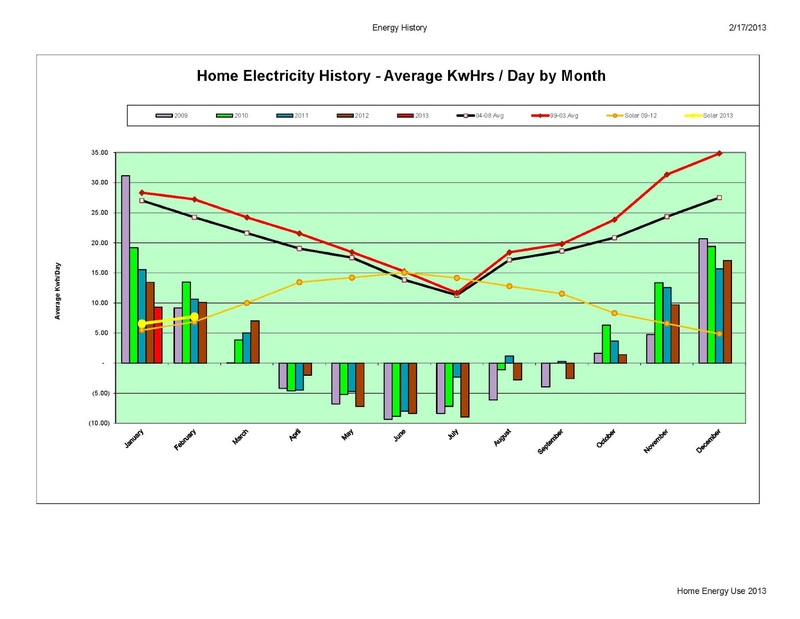 The combination of all these actions dropped our electricity usage by one fifth, down to 14.4 kwh/day. On average we produced 11.7 kwh/day from our panels and bought 2.7 kwh/day from our utility. (In the summer we produce more electricity than we use and sell some back to our utility. In the winter we use more than we produce and so buy.) 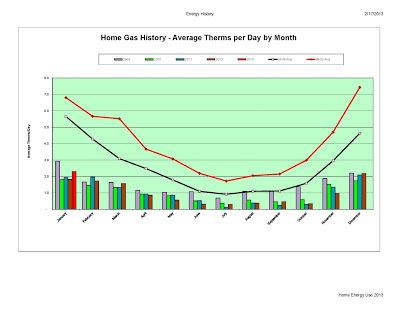 The insulation, heating system optimization, new windows, and cooler house temperatures made a dramatic impact on our natural gas use, which dropped by 40% to 1.7 therms per day. And yet there was more to do. The following year we installed a solar hot water system that dropped our natural gas another half therm/day. It went on the east-facing side of our roof, which is fine since most of our hot water use (showers, dishwasher, laundry) is in the morning. (Morning is also when electrical rates are cheaper.) Because the back up warming element of the solar hot water system is electric, it did bump up our electrical use an average of 2 kwh/day. 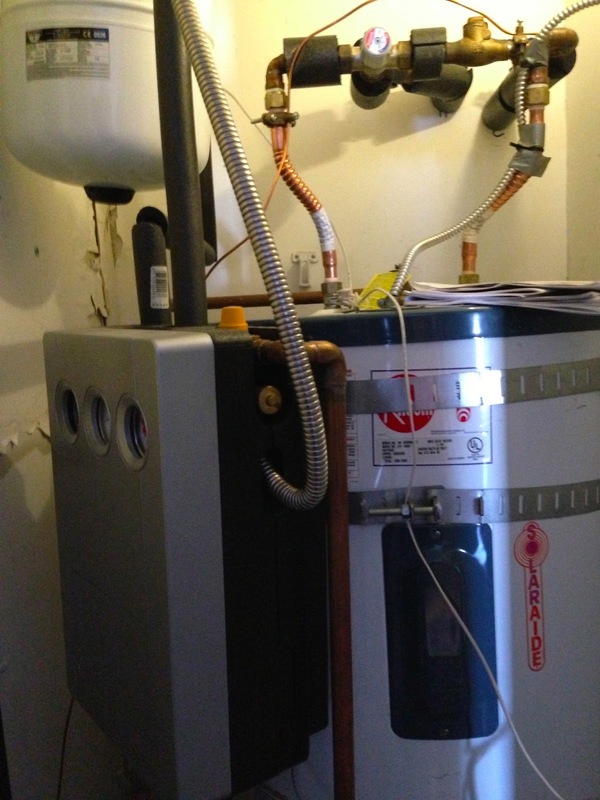 The year after that, when remodeling our decrepit downstairs bathroom, we installed an on-demand hot water system to replace our downstairs hot water heater, decreasing both water and natural gas use. We are down, now, to an average of less than one therm of natural gas per day, but it does vary depending on how cold our winter temperatures are. For both electricity and natural gas we rarely use amounts above our baseline quantity, which keeps the energy we do buy at the lowest rate. As we progressed along on our energy journey, we made a few step-level technology changes but, more importantly, we also made many, many little changes that added up in a big way. This is why I call it an evolution. It took time, experimentation, and a failure here and there to achieve our results, plus a willingness to change habits. The result is that energy, especially electricity in San Francisco, is quite a bit more expensive than it was in 2000. 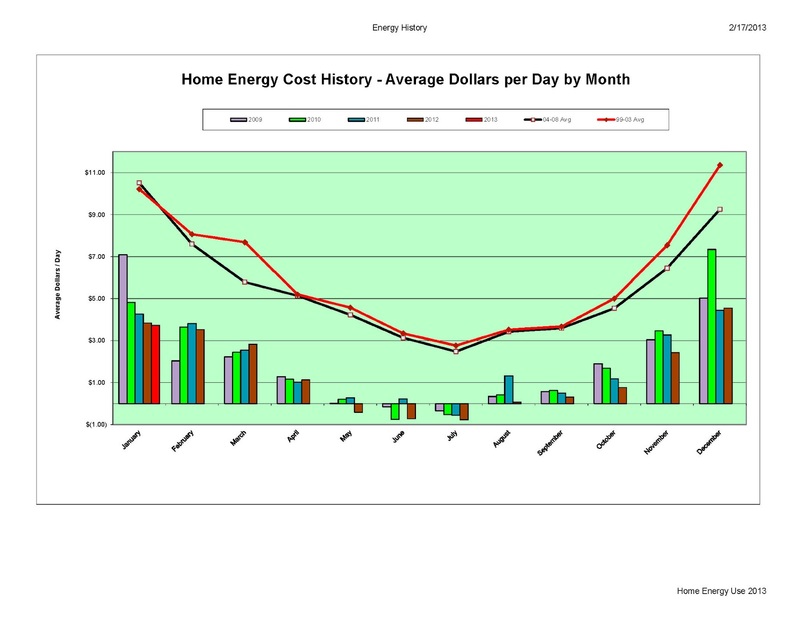 I calculate that if in 2012 we’d used the same amount of electricity as back in 2000, we would’ve paid $2402. (Back in 2000 we paid $1350 for this energy.) And if we’d used an equivalent amount of natural gas, we would’ve paid $1680 at today’s rates. Put the two together, we would’ve paid $4082 for energy last year. That means we’ve dropped our energy bills from what we would’ve paid by $3581 a year, or 87%! What we’ve invested (after tax credits and incentives): solar PV $12,000; solar hot water $5600; wall insulation, more attic insulation, house sealing, HVAC duct sealing and optimization $8000; repairing decorative paint on walls after insulation blown in $800; on demand hot water $1200; new windows not part of remodel $6000; various light bulbs, low flow showerheads and power strips $400. Total $34,000. (Am not counting appliances or windows we had to replace anyway or insulation mandated by building code during various remodels.) I figure we’ve already recovered $15,000 of our investment in savings. If energy prices increase by only two percent per year, we’ll recover the rest in six years. If energy prices increase by three percent per year, we’ll recover it in five. Also in 2008 we got rid of our minivan, leaving us just our 2004 Prius. Our annual gasoline purchases dropped from $2300 per year down to $1250. The average price for a gallon of gasoline in 2008 in the US was $3.16; in 2012 it was $3.63. That means we bought 728 gallons of gas in 2008 and 344 gallons in 2012. If we’d used as much gasoline in 2012 as in 2008, we would’ve spent roughly an additional $1400. Of course the expense of owning a car is only partly the gasoline. All the other costs to operate it come to far more. Though our van was totally paid for by the time we offed it, if we’d kept it we would’ve spent an additional $500 on car insurance, $3000 on repair and maintenance (van was getting old and falling apart), $170 on car registration, $150 on tires, $200 on parking, tolls and the rare carwash. This comes to $5420/year in car expenses avoided. Electric-assist grocery getter. Carries 5 bags uphill, no sweat! Without the extra car we did spend about $220/year on City Carshare (car rental by the hour), and about $1200 on family transit. However, at least two-thirds of that transit cost would’ve happened even with a second car as I wouldn’t have wanted to drive my kids around much more than I ended up doing anyhow. Although my husband and I mostly travel around town by regular bicycle, because we live up a ginormous hill, we also spent $800/year to buy and maintain two electric bikes. 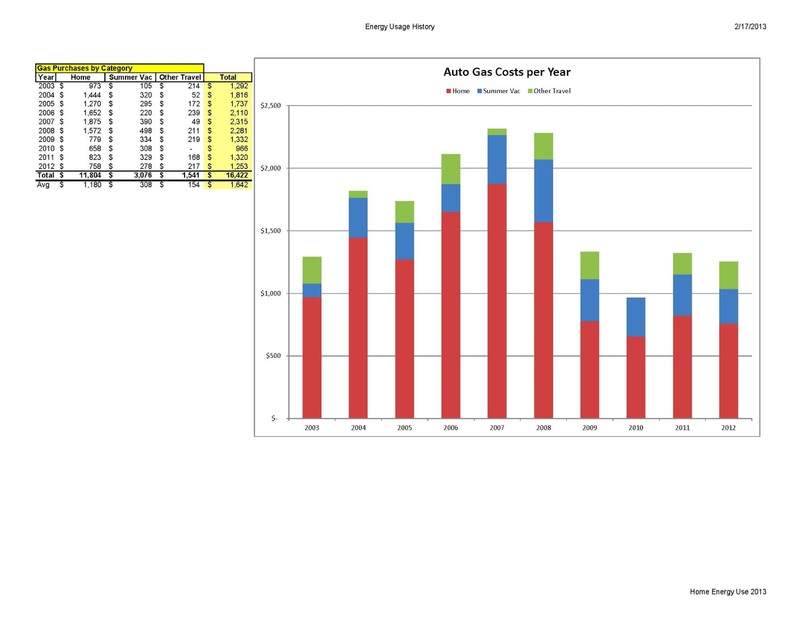 (Initial cost + maintenance + 1 battery replacement for each bike at year 3, with this total amortized over six years.) And we now spend $360/year for a storage locker on the island where we go on vacation every summer to hold stuff we formerly hauled there annually in our van. So net, our yearly savings are $3640. On top of this, by our teens not getting driver’s licenses between the ages of 16 and 21, we’ve saved on average $2000 per kid per year, which adds up to $20,000 so far and counting. (Thanks, kids! The money went to your college tuition.) And also, no kids driving meant no kids crashing, which meant no shelling out-of-pocket to pay the deductible on insurance claims, no increases in car insurance rates due to accidents, etc. But we are not done! Future goals are to install a ductless heat pump, deal with our drafty fireplace with some kind of insert, eventually replace all of our leaky single-pane windows, and, if we ever get our house tight enough, install a heat-exchange ventilator. With middle child now in college, we expect our vehicles miles travelled (VMT) to drop another 20 percent this year. Perhaps once we finish paying for college for all three kids (Done with one! Two left to go!) we’ll consider an electric car, but like everyone else I’m concerned about range issue for long trips. In addition, even minimal use of an electric car would raise our electricity consumption by at least a third, so we’d need to install more solar panels on our roof. If there were a medium-speed train that took less than ten hours to get from San Francisco to Seattle (heck, that’s only 80 mph—European trains do double that), I think we’d go car-free altogether and just rent a car when we needed to. Well done! You could add more solar PV if you'd like, it is probably a lot cheaper now than it was in 2009. Yes, solar PV is a lot cheaper now, although when we put ours in we hit a good period when there were city, state *and* federal incentives/tax credits reducing the cost. I think we will eventually put at least a couple more panels on our roof. If we were to do it again, I would've had at least three more panels put on during our original installation. So I've been wanting to learn more about solar energy systems. I find them pretty fascinating. Where can you get them? Great Post Karen! I have just done two long comments which blogspot has dumped in the circular file. Will try again perhaps. We have also fought the battle of the joules and watts tho" in two very different regions. I would like to share cost benefits. great work, as usual. Nicely done comprehensive review of your energy ameliorating strategies along with your rationale.I am amazed at your low kwh numbers for a decent sized house. Our log house is 3500 sq ft but we live in 2500. the other thousand is a garage apt, rented occasionally. I built that in 03 and it has spray foam insulation in roof and floor and R25 walls and r60 roof. Logs walls are under R10 so I build frame additions around 2.5 sides. The greenhouse runs 48' with lexan and glass and hollow concrete floors which circulate hot air. It was below zero last night and is 92 deg inside now warming the house thru french doors. Works great on sunny days. We dry our clothes in there in the winter and raise vegetables in the summer. My big salvaged copper solar hot water panel is INSIDE the greenhouse and it provides hot water from May to November. Our wood stove preheats hot water the rest of the season delivering 90-100 deg water. The greenhouse kicks out water at over 140 so our electric water heater hardly runs in the warm months. Heating hot water cut our kwh from 1200-1500/month to 1000 kwh(3600 megajoules/mo or 42000 megajoules/yr)), where we are now. We pay 6.8 cents kwh so around $60-70/month. It is for lights, fridge and clothes/dish washers, irrigation pumps as well as well pump and 500 watts/hr for the livestock as well as 500 watts winter plug in heat for the cars and trucks .We were going thru$300-400 year in propane for our cook stove but we now only use it in the summer. We cook on an Amish Kitchen Queen wood cookstove, a monstrous 800 lb cookstove which also heats the house unless temps are below -20 when we supplement with our LR wood stove.. We use 4 cords of wood/yr (72000 megajoules/yr)with most of the wood cut on the property or nearby. 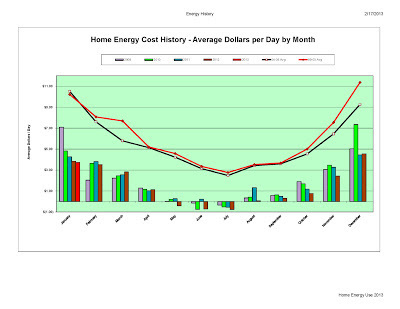 HRV are only of value in cold climates and tight houses. We are pretty tight but logs are logs. I have built and rebuilt many houses and my rule now is NO Remods unless you have no choice. Build new, build green and site the house to the sun. 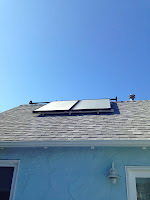 Solar heating of the house and water is of great value for anyone but except in certain circumstances the lousy efficiency of solar electricity is rarely cost effective. That said I have 500 watts in panels on our sailboat which run 100% of all electric needs on the boat. IN WY they will buy your generated elec at wholesale rates, not retail :2.8 cents. No state rebates either so not cost effective on grid houses. We use 1000-1200 gal of gas and diesel in 2 tractors, 3 cars and 2 trucks. My 2 cars are an 82 MB diesel(summer only) and a 2001 corolla for winter use. The MB get 32-36 mpg and the corolla 40-50. Both have over 250K miles. That is 126000 megajoules/yr for 1000 gal. THAT'S 126000 MJ FOR FUEL, 72000 MJ FOR HEAT AND AND 36000 FOR ELECT. WHEW! Your article made me do my own audit. I was surprised that fossil fuels were on top. Food for thought on the backside of Hubbert's peak. BTW I did cite you in one of my recent blogs. Good for you for doing your own audit! My husband is the keeper and charter of data in our family and he's been doing it for many years, which made it easy for me to do an analysis of our energy history. In fact, that's why I thought about doing the post, because I had the data available. You have very low electricity rates! In our utility district, time of use summer peak electric rates vary from $.28 per kwh (baseline) to $.50 kwh(tiers 4 and 5)! (Partial Peak rates: $.18 - $.38; Off Peak: $.10 - $.31) So there are huge benefits to moving electricity use to non-peak hours and reducing load (or producing your own energy) to keep off the higher tiers of the rate structure. And our utility will buy electricity from us at whatever the retail rate for the time produced. So that's a good deal for anyone producing solar in the summer afternoon sun. In the winter, the peak rate is after 5pm, so no benefits there. Very Impressive! I loved reading about your journey! We have been on that same journey since buying our home over ten years ago in New England. Additional insulation and that 'replace the windows' worked magic. We went off-grid on the solar solution as grid-tied systems shut down the homes electricity to ensure safety to crews working on the lines. We felt that wasn't acceptable when living in the sticks. Our children are now out and about (college or onto careers) and our energy use has dropped significantly. We are at the point where I can investigate seasonal micro-hydro feeding a grid-tied inverter to supplier electrical usage to zero. I will celebrate that month with Champagne! If we were in an area with lots of power shutdowns, I think we would've invested in off the grid, too. I was a little nervous about battery maintenance and getting through those rainy days in December (when our energy use is high and solar panel production is low for days at a time.) Yes, children are energy gobblers! Very interesting about seasonal micro-hydro. I think every region has an idiosyncratic set of energy production possibilities, and eventually we'll see all sorts of creative adaptations that make sense given a region's topography and resources. It seems to me that distributed energy production, while not easy to turn into an on-going profit stream for large corporations, can increase the resiliency--and ultimately the economic well-being--of the households, communities, regions that embrace it. Nice job. You did everything as I would have (except the tankless water heater ... tip - they really do require that maintenance the manufacturer recommends, that few people do) Your next steps seem on track to me as well. 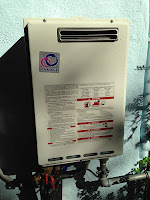 The Mini-Split Heat Pump is a great next step. The Energy Recovery Ventilator will probably happen when the rest of the windows go in and tighten things up a little more. All these things are exactly what we do in our company that does energy retrofits to foreclosed homes that we buy. One final thing you might consider is induction cooking. Keep up the great work. I wish there were more people like us. Thanks for the encouragement! I am surprised that general knowledge about heat pumps is so low in the US. (Heck, I didn't know about them until I started reading The Oil Drum.) Even now they seem far more economical than heating oil, but cheap natural gas gives everyone else little reason to convert. But as natural gas prices rise (which they must because nat gas companies are losing money, drilling has fallen way off, and the wells have steep depletion curves) that may change. Thanks for the tip about the tankless hot water heater. I will look into the maintenance. How great you are doing energy retrofits! It's almost an unimaginably huge task, making the US housing stock energy efficient one house at a time, but it's really the only practical path there is. Just curious, do you put heat pumps into all these foreclosed houses, and what (general) region do you do this work? thank you for not just putting 'lipstick on a pig'. solar modules are energy intensive to manufacture and have a low eroei, so conservation and efficiency upgrades are job one... and yield a smaller system which means cheaper prices and less materials... a win-win for everyone. unfortunately most installers will not recommend these changes first as they make more money putting in larger systems. ps... our home in the northern california mountains is zero energy with 4.5 kW of solar pv. our average daily consumption (including electric heating) is 14 kWh/day! What a great job you’ve done! That’s pretty much we would do on energy efficiency when we do our green remodel. For our heating and cooling system, we’ll have a hydronic forced air which use the air handler to move heat from the high efficiency hot water tank since the water is being heated 24/7. Another device I like to add is the On-Demand recirculation pump, which you press the button to activate. Instead of letting the water going down the drain, the cold water would be pumped back to the hot water heater. That saves water and energy. I’m looking into induction cooktops. They save about 10% energy compare to electric radiant cooktops. It’s a whole house green remodel, hopefully it’ll start in a couple of months. Well, I have to walk my talk since I created this website, http://greenremodelforum.com to help homeowners to understand the benefits of greening their homes by making them energy and water efficient and using sustainable materials. I will start my project soon. 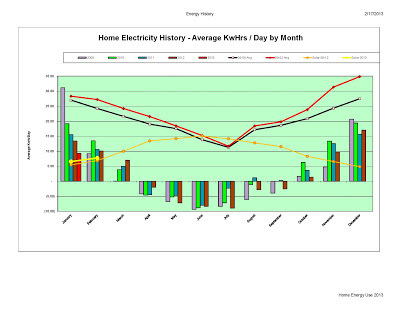 By the way, you did a great job keeping records of your energy usage. Would you like to share your experience with other homeowners how you drop your utility bill by 80%?